Over the past two weeks, a contractor has been employed to install a new layer of sand in all of our bunkers. The sand being used is from a local mine and is called "G Angle". Different from the sand that has been used in the past, this sand is "crushed" at the mine to create "angular" granuals. Most Florida sand is round in shape and can create softer playing conditions within the bunkers due to its structure and ability to compact. 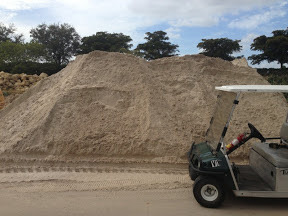 The "G Angle" meets the USGA recommendations for bunker sand. This new sand, due to its varying angles, resists compaction and so doesn't allow the ball to sink into the profile. 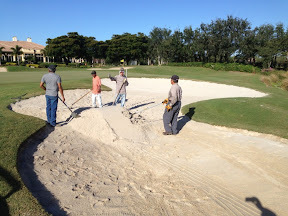 During this process, our own staff members have been hard at work preparing several bunkers for the new sand. Over 10 bunkers had all of the original sand removed due to contamination from organic material and drainage gravel. Over 650 tons of the sand has been installed throughout the course and is now providing consistent playing conditions and a beautiful contrast between the sand and the green turfgrass surrounding it. Please be aware that it will take "some" time for the sand to settle. 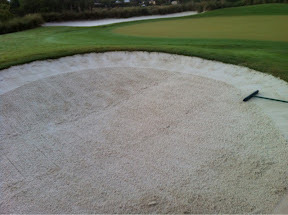 Daily raking with our bunker raking machines and the use of irrigation water will help with this process. 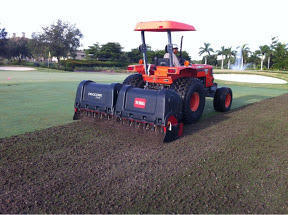 Last week all greens were "Deep Tine Aerified" using a Verti-Drain machine borrowed from a neighboring golf club. Using a penetrometer, a device used to measure compaction, it was discovered that our greens soil was substantially compacted 4 inches below the surface. This compaction was caused by our Toro Aerifiers in that the tines used when coring or spiking the greens are limited to this 4 inch depth. Over time, a "hard pan" is created and prevents water penetration, restricts root growth and oxygen exchange. 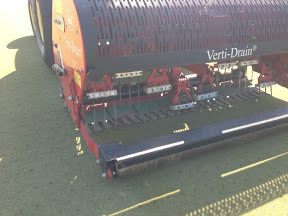 The Vert-Drain unit can be set to a depth of 10 inches using small 3/8" tines that have very little impact on the putting surface. 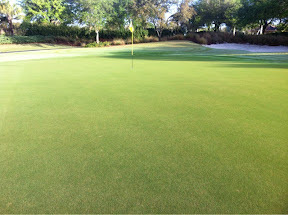 In fact, once rolled, the greens were ready for play. A noticeable improvement in turf quality was quickly realized after the deep tine application including a substantial improvement in water penetration from our sprinklers. I look forward to this cultural practice continuing monthly throughout the golfing season and helping to provide quality greens. At the October Greens and Grounds Committee meeting, the use of the 150 yard pole, located in the center of all par 4 and par 5 fairways was discussed. Interestingly, there was much discussion regarding the need of such a device considering Copperleaf utilizes both GPS and Laserlink prisms to help golfers with their yardage. Several attendees commented that they use the pole as an indicator for their shot direction whereas others said that it detracted from the beauty of the course. Unknown to many is that our new GPS units have the ability for the user to "tap" the screen and position a marker at their desired landing location on the hole to determine distance. It was decided to remove the poles for the immediate future and to gather member feedback to determine if the poles should be replaced. As part of the future golf course renovation review, it has been suggested by many of the Architects interviewed, including our selected Architect, Kipp Schulties, that Copperleaf is a "very long golf course". Golf courses that are being renovated these days are providing tee locations that provide for between 4,000 and 4,500 yards. These tee locations are intended to provide a more enjoyable golfing experience for the higher handicap golfer or for golfers new to the game. It also follows the "Tee it Forward" program being promoted by the PGA of America. Our current forward tees total 4,770 yards. After further review with Kipp Schulties, 10 new tee locations have been proposed for construction in 2013 that would bring the total yardage to approximately 4,500 yards. The CLGA has been involved in these preliminary discussions and have been asked to provide their input regarding the tee locations and the proposal in general. Interestingly, after reviewing the women's handicaps at Copperleaf, over 60% of our players have a handicap of 30 or more. Using guidelines provided by the PGA, a course of below 4,500 yards is suggested for these golfers. Not only will the golfing experience be improved but the pace of play will also improve as a result. 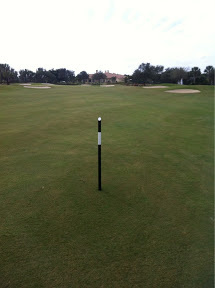 In an effort to identify the exact locations of the proposed tees, temporary tee markers have been placed on the course. These tee markers will only be used for a few days in an attempt to get some feedback from the players. The Golf Course Renovation Team, led by Jim Gallery, and CLGA President, Linda Francis, would appreciate any feedback that you may have. Our golf course closures have finished for the year and the onset of cooler, drier weather will soon be here. There was a multitude of work completed on the course during the closures including verti-cutting and aerification of the greens, aerification, verti-cutting and top-dressing of all tees, aerification, verti-cutting and top and verti-cutting and aerification of all roughs. ﻿ All of this work is carried out 'in-house' by our trained staff using our equipment. It takes an immense amount of co-ordination and communication with all staff members to complete the work on schedule and still provide sufficient time for the turf to recover and be in a playable condition upon re-opening. 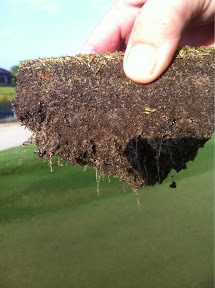 The benefits of these practices are numerous including improved turf rooting, penetration of rain and irrigation water into the soil, oxygen exchange in the soil profile, improved fertility uptake, smoothness of the playing surface, improved green speed, reduction in disease pressure, thatch reduction and overall improvement in playability for all golfers. Without question, the cultural practices carried out on the course can easily be frowned upon by most golfers, not only here at Copperleaf, but at every golf course throughout the world. From a management point of view, I too, dislike seeing the turf grass disturbed so much. It is by far one of the most challenging times of year; however,I know that the work carried out now will provide the highest chance of success during periods of turf stress and high golf play. I appreciate the patience of our year round golfers during these times and to please understand that these procedures are for the betterment of the course. As always, Mother Nature plays an important role in the success of the operation. 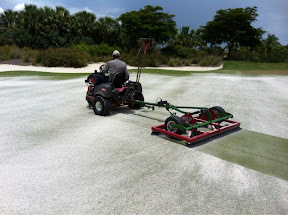 Any rainfall can slow the entire process down and make it extremely difficult to brush sand into the greens, drag the aerification plugs to break up the soil and to vacuum the verti-cuttings. However, with the teamwork of our entire staff, the ability of our mechanics to keep everything operating safely, and a little luck; everything always seems to get completed on time. It has already been a busy summer with various projects being undertaken throughout the property. 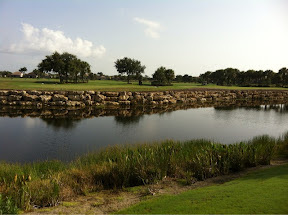 Without question, the most visible enhancement to the golf course this year is the construction of a rock wall along the lake bank of the chipping and putting greens. The project was conceived by the Green and Grounds Committee last year and approved during the budget process for completion in 2012. 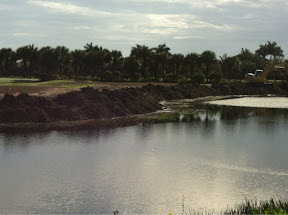 Once the golfing season had finished, the necessary permits from South Florida Water Management District and Lee County approved and the lakes were at their lowest level, work commenced in earnest. Heavy equipment was rented to prepare the lake bank, transport the rocks from the maintenance facility and to finally position the rocks. Ricardo Gomez, one of our senior staff members who has assisted me with previous rock wall efforts in the past, was once again asked to help with the project. He operated a large front end loader with a rake attachment to cautiously move over 250 rocks to the practice area. An excavator, with a hydraulic 'thumb' attachment was then used to precariously position the rocks in their final resting position. I was fortunate to have received training on this equipment back in Australia many years ago and enjoy the challenge of operating such powerful machines. There were 3 layers of rock used to produce the necessary height to match the level of the practice greens. Each layer had a cloth sheet placed behind it to help prevent erosion before being back-filled with soil. 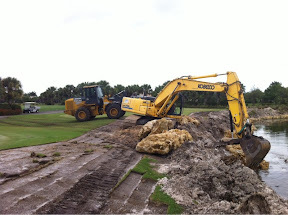 Over 30 trucks of soil was needed to level the newly created area between the practice greens and the rock wall. Additional sprinklers were added by Irrigation Technician, Neil Johnson, to provide water to the area. Sod was cut from out of play areas throughout the course and was installed by Assistant Superintendent, Riaan Potgieter, with help from our own staff members. In all, the project was completed in two weeks. Besides an enhanced view from the clubhouse and hole 18, the rock wall will allow for an increased practice area for golfers and potentially allow for future improvements. I can't thank my staff enough for the extra effort that it takes to complete such an immense project 'in-house'. 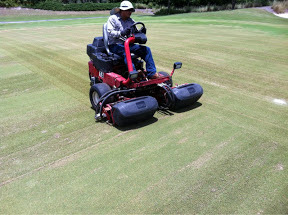 Incredibly, the entire golf course had all cultural practices completed during this time by our staff members including aerification of all greens, fairways and roughs as well as double verti-cutting of all fairways and the clean up that comes with it. I hope that you are as proud of, and thankful for our staff as I am. Sunday, July 8 at about 3 pm, I noticed a large plume of smoke in the air as I was heading to Publix on Ben Hill Griffin and Corkscrew. 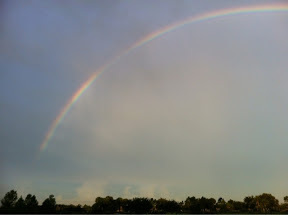 The vicinity looked like it could be coming somewhere near Copperleaf and so I called Don Lozzi to investigate further. Don drove to the maintenance facility road and called back saying that there was a large fire on the east side of I-75 in the Edison Estates vacant land and that thick smoke was covering most of Copperleaf. Within a short period of time, Ron Fowler, Peter Morin and Tom Bertucci were also calling to report that ash was now falling across Copperleaf. Using my home computer I was able to turn irrigation sprinklers on along the fence perimeter of hole 6 and also on the putting greens to help cool things down. Fortunately, Fire Fighters were able to contain the 40 acre blaze by 6 pm. Monday morning came with a thick blanket of smoke still covering our northern holes as there was very little breeze to help dissipate the haze. The pro shop was asked to warn our golfers of the thick smoke on holes 2 through 9. At 8 am, this shot was taken looking across the 4th hole with heavy smoke sitting on the water and the golf course. One of my good friends, fellow Australian and Superintendent at Vanderbilt Country Club, Stuart Bothe was asking whether I had ever cleaned out our fuel storage tanks at Copperleaf. 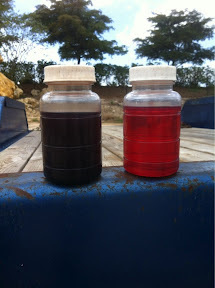 I mentioned that we use the recommended fuel filters, both on the tank and on the equipment and that fuel stabilizers are placed into the fuel each time the storage tanks are filled. However, I had never considered cleaning the storage tanks themselves. He mentioned a local company, Clean Fuel and Tank, that he had recently used and so I called them up. Company owner, Randy Mote, came out to inspect our tanks and observed that our diesel and mixed gas tanks had some fairly significant issues with regard to contamination. For a reasonable price, Randy was able to return with his filtration equipment and siphon the fuel through various sized screens and filters. Incredibly, Randy removed over 8 gallons of 'sludge' from the 200 gallons currently in the 400 gallon diesel tank. The image below clearly shows the difference. Without question, the results have been significant. Improved fuel economy, increased efficiency of fuel filters and improved engine performance are all benefits achieved by completing this project. Copperleaf will now perform this task bi-annually, or as needed, to maintain the integrity of our fuel stored at the maintenance facility. Without question we have experienced an extremely busy golfing season over the past few months. 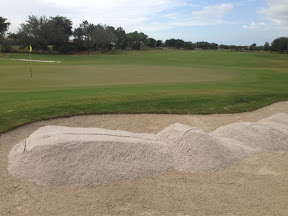 The amount of play and golf cart traffic have had a negative impact on our Coquina Waste Bunkers through compaction. Although the waste bunkers are raked twice weekly, the excessive compaction is not allowing our raking machines to penetrate down into the aggregate. The hardened surface has been proving difficult to hit from for all levels of golfers. To address the situation, a self propelled roto-tilling machine was rented to penetrate down 3 inches and soften the material. Once the sand material was cultivated, one of our bunker raking machines, using a mid mounted scarifying attachment was used to smooth the surface. The end result was a much softer and forgiving playing surface for all. As an added bonus, the deep orange color of the Coquina shell was returned providing a great contrast between it and the dark green turf. The Green and Grounds Committee is always listening to member feedback and continues to look for ways to improve the golfing experience for all members. 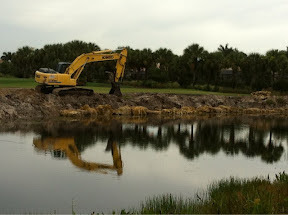 Over the summer of 2012, several Coquina areas are planned to have their size reduced without affecting the integrity of the golf course. If you have any questions or comments, please do not hesitate to contact me directly at davidd@copperleafgc.com. 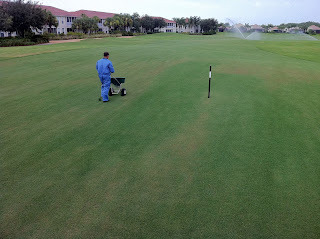 It is already that time of year again that our cultural practices to maintain healthy turf begin. Last week, the mowing height of our rough was lowered from our winter height of 1.5 inches down to the summer height of 1.25 inches. 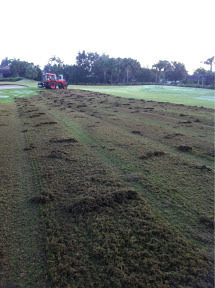 This 1/4 inch reduction helps to remove the 'puffiness' of the thick Bermuda grass and provides a more even turf growth. In the out of play areas where the grass has experienced little compaction from golf carts, the turf is scalped down and will take 2 to 3 weeks to adapt to the new height. In areas where cart traffic has been abundant, there is little to no effect. The cart traffic area, seen here on hole 17, shows no effect to the lowered height. The area in the foreground will take several weeks to adjust to the lowered height. 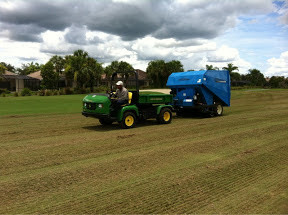 Areas that are scalped down will produce grass clippings that will be cleaned up using the large turf vacuum. This machine, by Harper-Goosen, is new for this year and replaces our 2004 Toro 'Rake-O-Vac' unit. The new machine produces less dust which is great for those members close to the course. This area of grass clippings will soon be cleaned up by our turf vacuum leaving a consistent area to play from. In July and August, during our 9 day course closures, the rough will be cut at a height of 1 inch and also verti-cut to remove excessive organic material. This allows water, nutrients and oxygen to enter the soil more efficiently. It also helps to promote an improved ball lie where the ball does not sink down into the turf canopy. The end result is a healthy and consistent playing surface for all to enjoy. As the 2012 winter golfing season comes to an end, I wanted to thank the many members that have complimented my staff and I for the condition of the course. The maintenance staff have worked tirelessly to prepare and present the course to a high standard on a daily basis. There have been many golf events over the past months and the staff always seemed to dig a little deeper to complete the many details that help to set our course above many others in the area. The weather conditions this year have played an important role in keeping our grass green and healthy. Fortunately, we have been receiving some rain when it was needed that has helped sustain the turf and shrubs. The wild flowers, that had struggled earlier in the year due to the warmer weather have now bloomed and look fantastic. 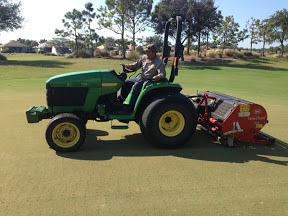 There have also been many cultural practices performed behind the scenes to promote turf health. These include bi-weekly spiking of greens, top dressing tees and greens, rolling of greens, spoon feeding of fertilizer and the use of soil wetting agents to name but a few. The roots on our turf have been excellent all season long and that has proven to be critical in keeping quality turf conditions considering the lack of rain, high temperatures, windy conditions and record rounds of play. I can't thank all of my staff enough, in particular Riaan Potgieter, our Assistant Superintendent, our mechanics, Luis and Pedro, Mike Terrill, our Integrated Pest Manager and Neil Johnson, our Irrigation Technician. Please, thank all of my staff as you see them out on the course. As the summer weather approaches, so does the preparations for our summer golf course enhancements. 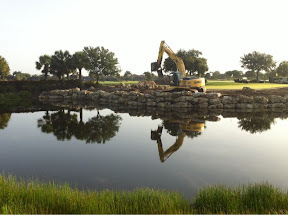 This year, the most significant project will be the construction of a rock wall along the lake bank of the chipping green and putting green. A modification to our lake system permit is currently being submitted to the South Water Management District, as well as The Brooks Community Development District. 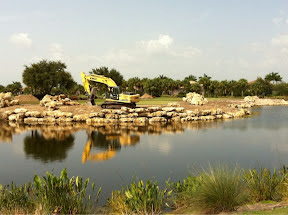 Once these approvals have been received, work will commence on transferring the rocks, currently held at the maintenance facility, to the area between the two practice greens. A large wheel loader will be rented to move these heavy boulders. The rocks will be put into place using a rented excavator capable of positioning the rocks in their desired location. The completed rock wall will then be back filled with soil to level the current practice area and provide increased area for all members to enjoy. The rock wall will be visible from hole 18 as well as the club house and help contribute to improving the overall appearance of the area. I will keep you informed as the project gets underway some time in May. Please be careful around the construction area as there will be heavy equipment and unstable conditions during the approximately 2 week construction timeline. If you are observant, you may notice dozens of small orange dots on the fairway of hole 10. 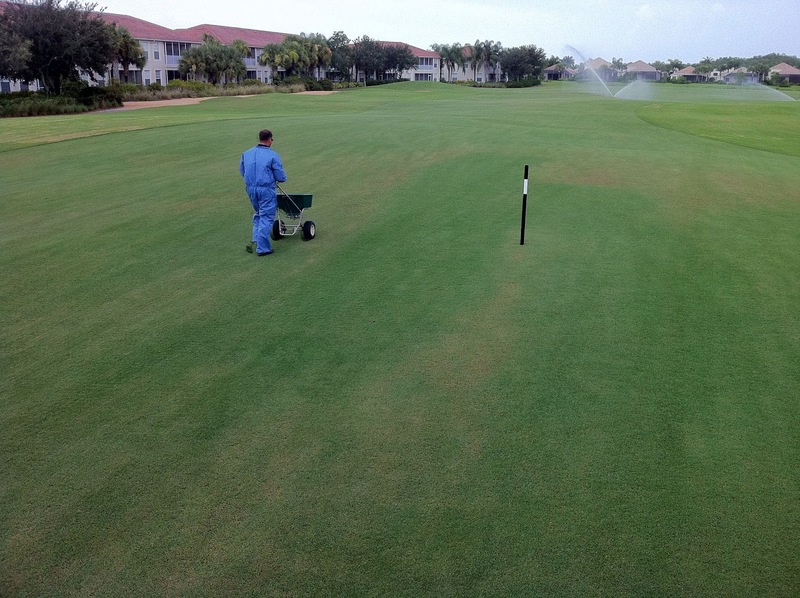 The University of Florida has selected Copperleaf to help conduct testing on products that control Nematodes. After sampling other area club's, Copperleaf's counts of these microscopic worms that live in the soil, were the highest, and so will provide the most accurate data for their trial. If you look closely on hole 10 fairway, you will see the orange paint highlighting the different test plots. The soil sample locations were filled with white sand. Nematodes are not visible to the naked eye, however can cause injury and death to susceptible hosts, such as Bermuda grass. The grass becomes weak, thin and drought stressed as the roots are reduced to less than an inch in depth. Unfortunately, the one product that successfully controlled this nuisance pest was removed from sale in Florida over a year ago. There are now many companies promoting the latest and greatest products to control the insect and it is difficult, as an end user, to determine which product is the most effective. 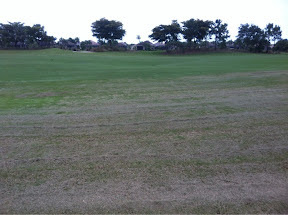 The dark green strips of turf were treated one week prior with Nemacur. 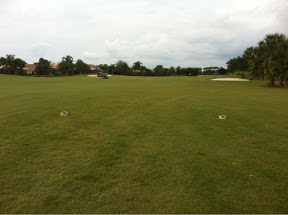 The results were so drastic that a second application was made to blend the weakened turf into the rest of the fairway. This picture was taken during the summer of 2011. Using a grant from Bayer Crop Science, Dr. Billy Crow is testing the effectiveness of one of their products, Nortica, that was released last year. The research data will be shared nationally for all Superintendent's to review once the study is complete. 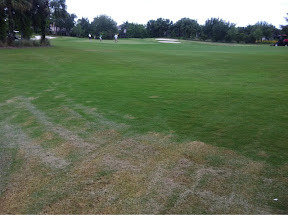 Unfortunately, Copperleaf is impacted with nematodes throughout the course and it takes additional maintenance practices to prevent damage such as additional watering, the use of moisture retention products and additional fertilizer. Nematode damage becomes most prevalent beginning in March when dry winds, warm temperatures, low rain and compaction from the golfing season begin to take their toll on the turf grass. The true benefit of conducting such a study at Copperleaf is that we will directly benefit from the data gathered to determine if this new product will improve turf quality under our conditions. We can then determine if applying this new product is worth the investment. I look forward to sharing the results with you as they become available. Some of you have asked what the orange dots are located on the edge of our fairways? These dots are used by our fairway mower operators to indicate the direction to mow that particular fairway each time. 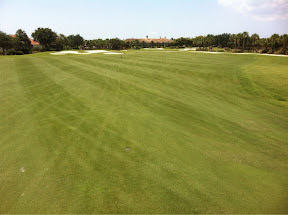 This way, the stripe pattern, that you often see on televised golf events, is seen on our fairways. This is been done to the lead up to the Club Championship event this weekend and provides a different appearance on our Bermuda grass fairways. Unfortunately, due to the natural growth habit of Bermuda grass, these patterns are not easily created and so need to be repeated several times. On cool season grass, where the leaf blades are longer, these patterns are very easy to create and maintain after a single pass of the mower. The orange paint, as seen here on hole 3, allows our operators to know exactly where to start their first pass. I hope you enjoy the patterns this weekend; good luck to those members playing in the 3 day event. Hole 6 with the mowing stripes cut into the fairway. Due to the large volume of play experienced during this time of year, there are several cultural practices utilized throughout the course to continue to provide quality conditions. 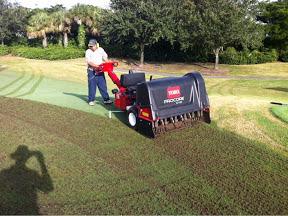 One of these practices is to 'spike' the putting greens with thousands of holes approximately the size of a pencil that travel 3 1/2 inches into the soil. Thousands of tiny holes are created in the putting surface. The benefit of spiking the greens is to alleviate compaction, allowing water and nutrients to enter the root system and to allow oxygen exchange to promote healthy turf grass. Once the greens have been spiked, a light weight roller smooths the putting surface ready for play followed by a light top-dressing of sand. 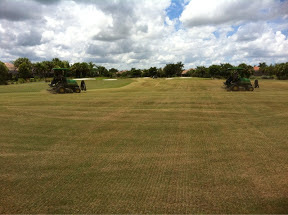 Copperleaf utilizes two Toro 648 greens aerifiers to complete the practice before play. Jose Salazar is seen here on hole 16. All greens are spiked in one day with 9 holes being completed before play in the morning and the remaining greens completed in the afternoon. 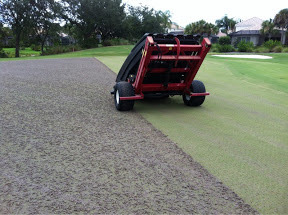 The end result is a smooth, receptive and healthy putting green that can handle up to 240 rounds of golf per day for over 3 months. As you are enjoying your next round of golf at Copperleaf, please pay attention to the refurbished tee signs located at each tee complex. The original signs were sand blasted, re-painted black and attached to a new post before being installed. By utilizing the original signs, several thousand dollars were saved over purchasing new. The end result provides a vast improvement over the faded green signs and posts that were installed over 10 years ago. Copperleaf expects a round of golf to take just over 4 hours when playing in a stroke play format. However, I had a complaint recently of some exceptionally slow play that I was asked to investigate. After closer inspection, I found the culprit on hole 18 and quickly asked the offender to pick up the pace and move to the next hole. Fortunatley, he said that his round was over and decided to cool off in one of our adjacent lakes. This little fella decided to hold up play just before the openning round of the Member guset tournament. We are fortunate to have a wide variety of wildlife co-existing with the members of Copperleaf and enjoying the habitat provided for them. 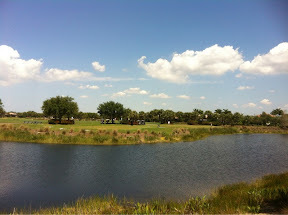 It is great to see so many of our members and their guests enjoying the beautiful weather out on the golf course. In fact, the course has been receiving over 230 rounds of golf per day for the past several weeks. With this increased play, our turf grass becomes affected due to the cart traffic and the compaction of the soil that they create. As can be seen here, cart traffic is our number one cause for stressed turf. The use of signs and stakes has been implemented throughout the course in an effort to guide golfers where to drive their golf carts, and importantly, where not to drive their golf carts, so as to preserve the health of the turf and provide quality conditions. Please help by following the directional signs placed strategically in certain locations, do not drive in between the green and white stakes, stay off tee slopes and do not follow the golf cart in front of you when driving on the fairways. Utilizing the 90 degree rule is extremely helpful by staying on the cart paths as much as possible. Also, when travelling down the hole, please scatter in the fairway rather than the rough to help maintain dense turf in these areas. 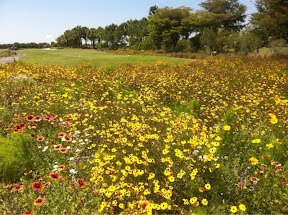 The longer growing rough can not withstand the constant stress of cart traffic, especially during these cooler months. I appreciate the help in maintaining your golf course. The cold weather last week brought us our first frosts of the year. There were two mornings with below freezing temperatures that produced frost on our turf grass for several hours. This frost has a damaging affect on the 'rough' turf grass, in particular, due to its higher height of cut and the ability for the ice to settle down into the canopy. The closer mown turf grass on the approaches and fairways has the ability to maintain a higher soil temperature and so withstand the cold weather without as much injury. The frost has a damaging affect on the higher mown turf grass (foreground) as seen on hole 12 whereas the fairways (background) have shown relatively no color loss.. The entire golf course was fertilized with granular fertilizer this week and will be followed up with a liquid fertilizer application over the weekend to help promote turf recovery and greener grass. The affected areas of turf will soon grow out of this condition and the affected leaf blades will be mown off. Our greens were prepared before the frosts with an application of liquid fertilizers that was very successful. A wetting agent, Hydrahawk, that displaces dew from the leaf blade, was also applied to the greens and tees prior to the frost that prevents the ice from forming. 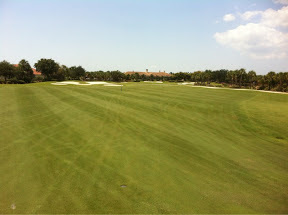 Overall, the golf course remains in excellent condition with fast greens for all to enjoy. if you have any questions, please do not hesitate to contact me. Following the reconstruction of the driving range this past summer, I wanted to pass along to our members the correct way to take divots when practicing so that the turf grass remains in playable condition throughout the cooler months when the warm season Bermuda grass is slow to recover. With some YouTube searches, I was able to find this excellent video describing the correct method to take pratice divots created James Beebe, from Priddis Golf and Country Club in Canada. As you can see, it is recommended to place your next shot directly behind the previous shot to make a line of divots about 2 to 3 feet long. Once that channel has been completed, move the ball over several inches and begin the process again. In this manner, a far greater area is made available for the next golfer to practice from rather than 'connecting the dots' if the divots have been spread out over a large area. Importantly, this method of taking divots makes it a lot easier for the maintenance staff to fill the voids with sand each morning rather than spreading the diot mix over a large area. Also, Jason Miller and his staff will find it much easier to position the tee stations in the correct location each day as the practice area will be well defined rather than spread out over a large area. Overall, the practice tee has matured extremely well since re-grassing in June. 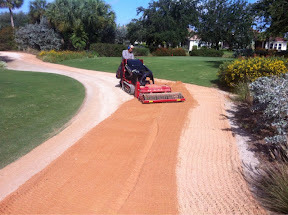 Fertilizer is applied weekly and the entire tee is top-dressed with sand every two weeks to provide quality conditions for our members and guests to enjoy. Please do your part to keep the practice tee at the high level expected at Copperleaf. Unfortunately, it was inevitable. The beautiful and mild weather we have been experiencing over the past month is coming to an end this week. Temperatures are expected to dip to the mid 30's by Wednesday morning and last for several days. This cool weather has a detrimental affect on our warm season Bermuda grass and so in preparation, our greens were sprayed with liquid fertilizer this morning.